Itoigawa Global Geopark encompasses the entirety of the City of Itoigawa. Stretching 45km east to west along the coast and rising from 0 to nearly 3000m in elevation from coast to its highest peaks, the City of Itoigawa is home to rich geological and topographical diversity. From the sparkling jade found along the Itoigawa and Omigawa Coasts, to majestic mountains and volcanoes like Renge and Yakeyama, the Itoigawa Global Geopark has something for everyone. 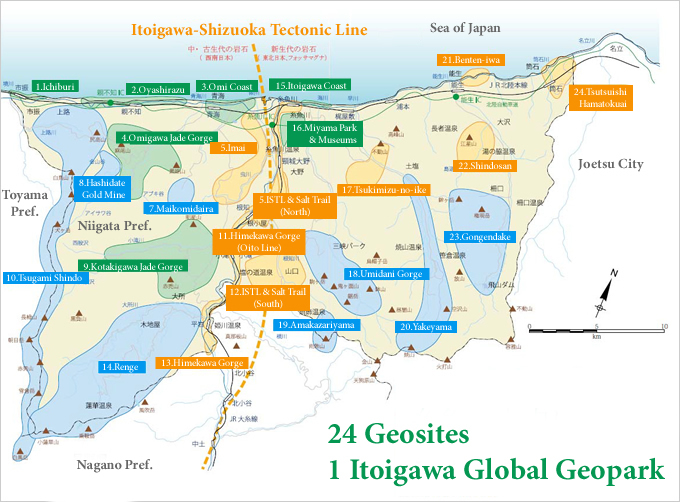 To help visitors better explore and understand the Itoigawa Global Geopark, we have selected 24 regions within the Geopark which we believe have particularly outstanding features. These regions, which we call Geosites, are located throughout the region and feature visitor facilities like parking, information panels, and more. The Geosites are grouped into three categories, to help distinguish them: Jade Geosites; Himekawa, Itoigawa-Shizuoka Tectonic Line, and Fossa Magna Geosites; and Mountain Geosites. Be sure to read about each site while planning your visit! These Geosites are primarily connected to jade either geologically or historically. They are almost entirely located west of the Fossa Magna. The Fossa Magna, the Itoigawa-Shizuoka Tectonic Line, and the swiftly-flowing Himekawa River. These Geosites focus on these geological phenomena and the culture that developed around them. 8 Geosites are found within the mountains. Many of these Geosites require mountaineering or trekking gear to fully experience, but they offer some of the most unforgettable sights within the Itoigawa Global Geopark.